Beyond Bedding is a great place to shop for gorgeous bedding sets especially Kids bedding sets. They have a variety of designs and colors and themes and I love that you can choose from more than just a couple different styles! I received a set from the teen bedding category. Although I would have loved any pink bedding I chose this Turquoise and BrownBedding Set to make my boyfriend happy! I figured the colors were more gender neutral. This 3 piece set is gorgeous and I love the damask print. It looks great in my bedroom! It’s made of 100% cotton and is so so soft. 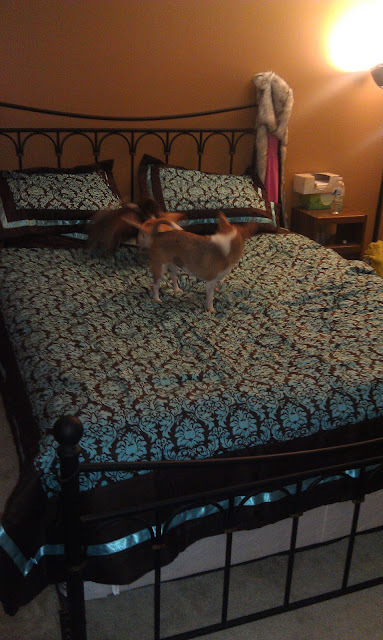 The set included 2 standard pillow shams and an 86x86 full queen comforter. I love the shams! They are great for decorative pillows and I honestly love the high quality of this comforter. I get very hot and cold depending on the weather and this was actually perfect. It didn’t make me too hot or too cold at night. I can use this set year round which is great! I am going to be purchasing all of my bedding from Beyond Bedding in the future!! Oooh! I LOVE this! The colors are gorgeous, I'm going to have to go check them out!